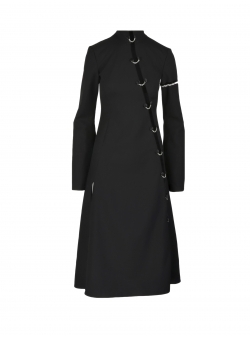 A very elegant and easy to wear piece made to impress. Composition: cotton and polyesterThe model is approximately 175 cm tall and wears size S.
This dress is a great option for casual days when you just want to feel real comfortable. Composition: 100% linenThe model is approximately 175 cm tall and wears size S.
Dark grey dress with volume in the front. Figure loving design. Composition: 100% cottonThe model is approximately 175 cm tall and wears size S.
Black dress with asymetric cut and neckline details. Composition: 100% cottonThe model is approximately 175 cm tall and wears size S.
A white dress that is perfect for the summer days! Composition: 100% viscose The model is approximately 175 cm tall and wears size S.
A black dress that is perfect for the summer days! Composition: 100% viscose The model is approximately 175 cm tall and wears size S.
Black dress with pleats and back bow - Invisible zipper - Invisible pockets - Composition: 67% Cotton, 33% Polyester - Wash at low temperatures The model is approximately 175 cm tall and wears size S.
This beautiful ivory dress features a waistband and buffalo sleeves for an elegant silhouette. The dress is decorated with delicate creases. 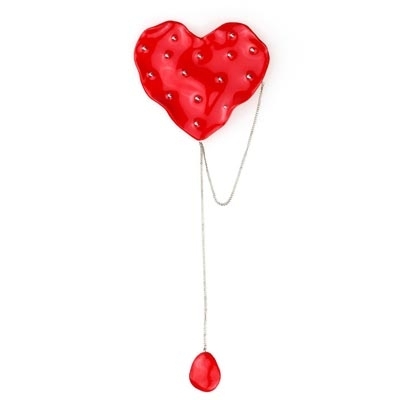 Wear it with a pair of black high heeled sandals. Composition: 67% Cotton, 33% Polyester Machine wash at 30 degrees. 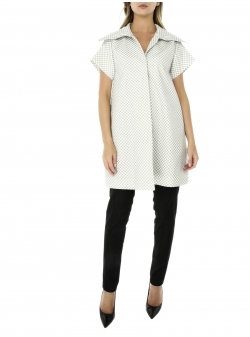 The model is approximately 175 cm tall and wears size S.
White tunic with grey polka dots - Closing with hidden caps - Side pockets - Composition: 80 % Cotton, 20% Polyester - Wash at low temperatures The model is approximately 175 cm tall and wears size S.
This comfortable dress has a relaxed silhouette for everyday wear: - The sleeves feature a unique closing detail - Composition: 60% Viscose, 40% Polyester Machine wash at 30 degrees. 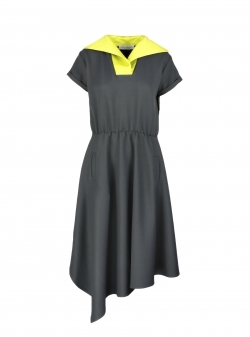 The model is approximately 175 cm tall and wears size S.
This stand out dress features: - Contrasting neon collar - Side pockets - Composition: 35% Cotton, 65% Polyester - Machine wash at 30 degrees. The model is approximately 175 cm tall and wears size S.
White mini dress with embroidery and ruffles. Closing at the neck line. Layered shoulder ruffles. Pair it with a pair of white stiletto flats for a romantic outfit. Composition: 100% silk Dry clean The model is about 170 cm height. Black mini dress with embroidery at shoulder level. This delicate and dreamy dress features ruffles and an open back. Composition: 100% silk Dry clean The model is about 170 cm height. 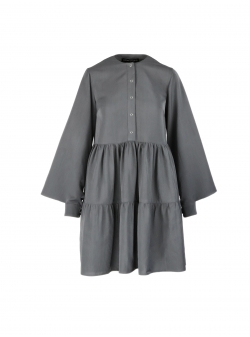 Delicate grey silk dress with an asymmetric cut. Dream-like ruffles ornate the sleeves and the hem. Composition: 100% silk, 100% viscose Dry clean The model is about 170 cm height. Black silk tulle mini dress with delicate shoulder details. One size Composition:100% silk, 100% viscose Dry clean The model is about 170 cm height. Cocktail mini dress with pleats and shoulder bows. 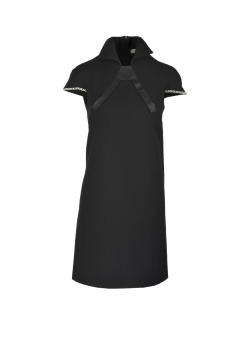 The V neckline and the side part closing flatter any figure. Wear this charming cocktail dress with your favourite statement high heels. One size Composition: 100% silk, 100% viscose Dry clean The model is about 170 cm height. Cocktail mini dress with pleats and shoulder bows. The V neckline and the side part closing flatter any figure. Wear this charming cocktail dress with your favourite statement high heels. One size Composition:100% silk, 100% viscose Dry clean The model is about 170 cm height. 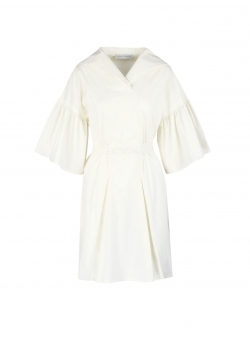 Viscose midi wrap dress with three quarters sleeves and v neckline. - pockets - leg cut - 100% viscose Model is 175 cm tall, bust 88 cm, waist 66 cm, hips 90 cm and is wearing size S.
White cotton shirt dress with low creases and embroidered details. - pockets - mini length - 100% cotton Model is 175 cm tall, bust 88 cm, waist 66 cm, hips 90 cm and is wearing size S.
Green cotton mini dress with cleavage cut and long sleeves. 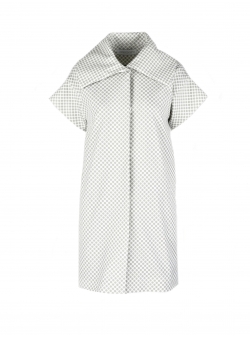 - pockets - low overlaps - 100% cotton Model is 175 cm tall, bust 88 cm, waist 66 cm, hips 90 cm and is wearing size S.
White shirt cotton dress with three quarters sleeves and low overlaps. - loose tailoring - pockets - mini length - 100% cotton Model is 175 cm tall, bust 88 cm, waist 66 cm, hips 90 cm and is wearing size S.
Relaxed fit dress with long sleeves and low asymmetric ruffle. - geometric print - round neckline - pockets - 100% viscose Model is 175 cm tall, bust 88 cm, waist 66 cm, hips 90 cm and is wearing size S.
Blue cotton dress with V neckline, asymmetric cut and drapings. - three quarters sleeves - deep neckline - pockets - 100% cotton Model is 175 cm tall, bust 88 cm, waist 66 cm, hips 90 cm and is wearing size S.
Red mini cotton dress with round neckline and decorative ruffles on one shoulder. 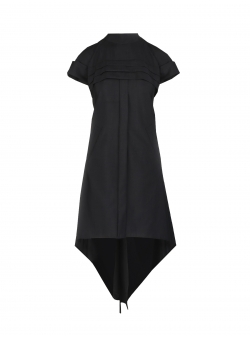 - straight fit - lined - 50% cotton, 50% viscose Model is 175 cm tall, bust 88 cm, waist 66 cm, hips 90 cm and is wearing size S.
Loose fit cotton dress with side pockets and three quarters sleeves. - round neckline - mini length -100% cotton Model is 175 cm tall, bust 88 cm, waist 66 cm, hips 90 cm and is wearing size S.
Blue mini poplin dress with loose tailoring and side pockets. - back zip fastening - 100 % cotton - asymmetric cut Model is 175 cm tall, bust 88 cm, waist 66 cm, hips 90 cm and is wearing size S.
Multicoloured sequins mini dress with flared sleeves. Wear it on your next night out with heeled sandals. - Zip fastening - Round neckline - Slighly flared sleeves Model is 175 cm tall and is wearing size S.
Strapless mini dress with pleated ruffles on one side. Wear it to a beach party with a pair of gladiator sandals and statement accesories. - back zip fastening - pleated ruffles - unfinisted seams Model is 175 cm tall and is wearing size S.
Dress with high neckline. Body fitted. Open back. Hidden zipper at the back. Embellished with Chantilly lace and cotton cords. Lined with mesh. Wash machine 30-40 degrees 80% synthetic, 15% lace, 5% cottonModel is 168 cm tall and is wearing size M.
Loose slipdress with cowl neckline. Open back crossed with an elastic cord. Lined with mesh. Waist cut-outs embellished with Chantilly lace. Wash machine 30 degrees 80% synthetic; 20% laceModel is 168 cm tall and is wearing size M.
SIlver hooded mini dress with adjustable waist and applied pocket. Wash at 30C 60%viscose, 10%elastane, 30%cotton Model is 1,68 tall and is wearing size M.